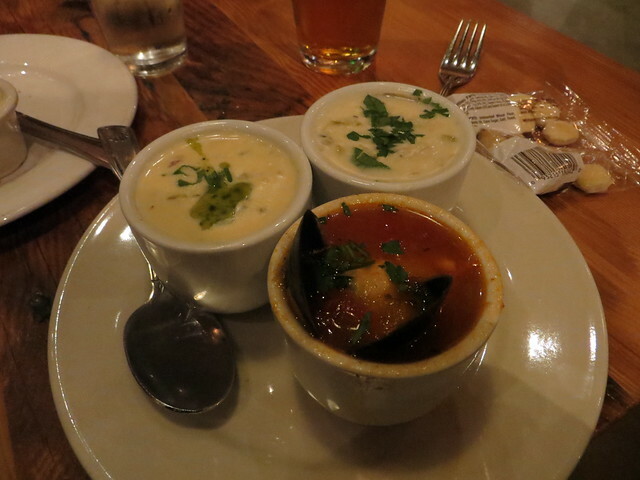 Chowder trio at Blue Mermaid. Okay, less blah blah dietary issues and more food pics? Am I right? We took public transportation from SFO to our hotel, which was fine until the final leg — the bus. Let’s just say that this particular bus experience was harrowing enough that we took our first Uber to Golden Gate Park. Needed a break from the insanity. Our first lunch (Friday) was from the outdoor food stand at the CA Academy of Sciences. It was nothing to write home about (although I realize that’s what I’m doing right now?). I think I had a “vegan wrap” (foreshadowing) with not as much hummus as advertised. Friday dinner was chowder and oysters and fried seafood-y goodness at the Blue Mermaid, the restaurant at our hotel. It was a bit pricey, but my parents had really raved about it. 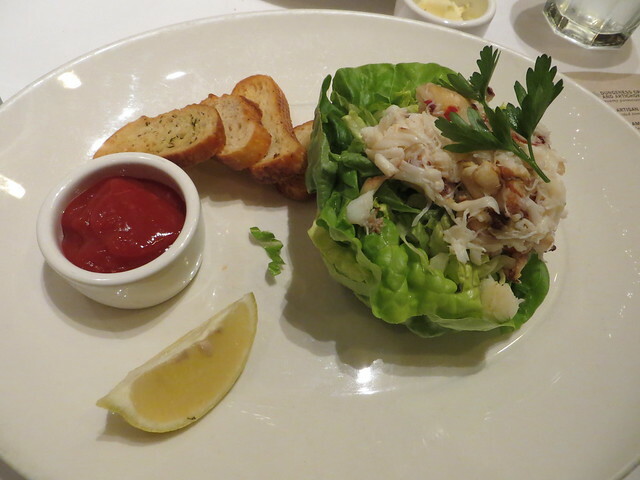 If I went back I’d save my $$ and eat from a chowder stand on Fisherman’s Wharf… there are many. 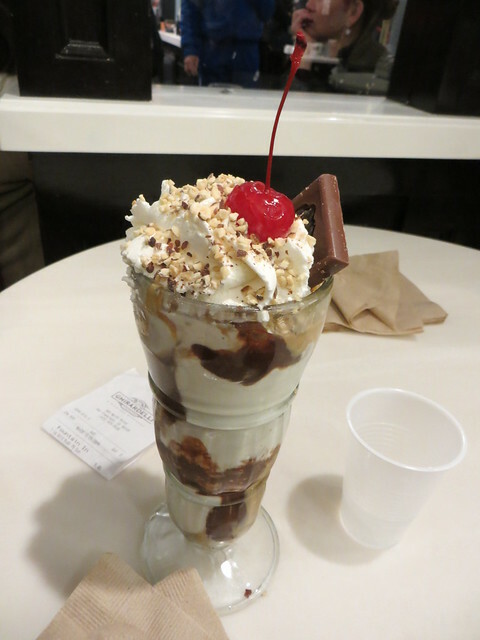 Then we walked around, went to the Musee Mecanique (weird but fun), and had Ghirardelli‘s for dessert. I mean, we had to go to Ghirardelli Square. It’s SF-tourist law. The Gold Rush. It involves peanut butter. I’m not usually one for chocolate sauce, but they really have it down to a fudge-y science. 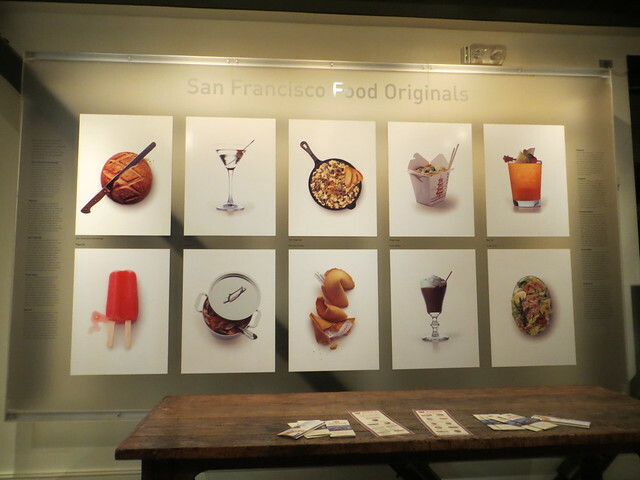 The next day for pre-lunch we walked to the Farmers’ Market at the Ferry Building (Embarcadero). 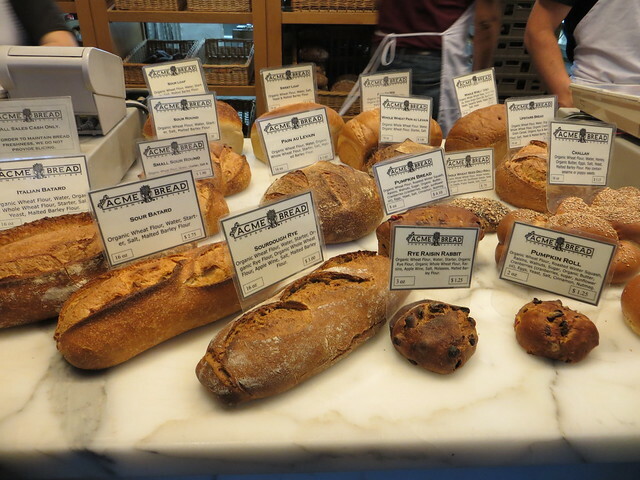 There we picked up our first (yes, first) loaf of sourdough, from Acme Breads. 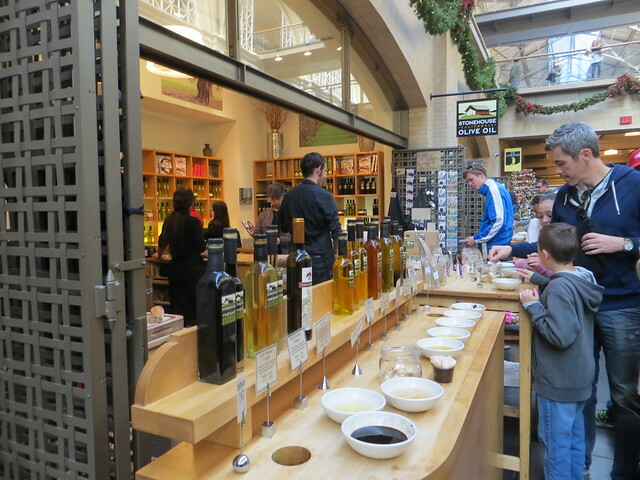 We bought a sampler of their flavored oils, which have been useful in everything from cooking chicken to making a light salad dressing. We finally pulled ourselves away to peek at AT&T Park on our way to first and second lunch in the Mission. Lunch stop #1 was to try a Mission-style burrito. This type of Mexican food is the inspiration for my beloved Chipotle. 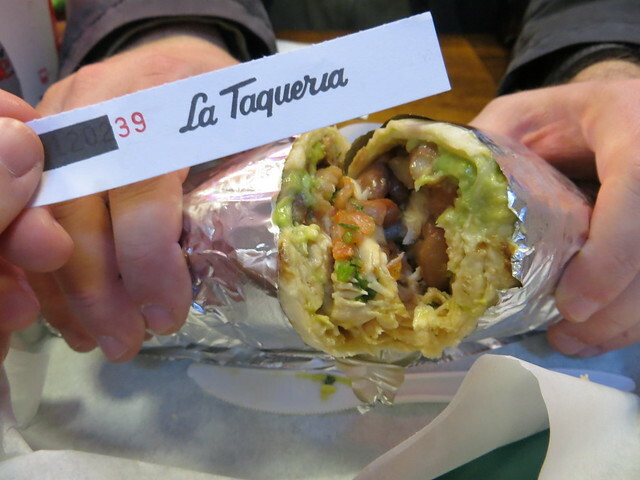 We shared a very good chicken burrito at La Taqueria, which was hopping. I’m still kicking myself that I didn’t sample the green sauce that was on the table. Next time, green sauce! Anyway, we went to Bite Me, and we split the “Love Affair” sandwich, and it was VERY romantic, especially because Episode 1: The Phantom Menace was playing on the TV. 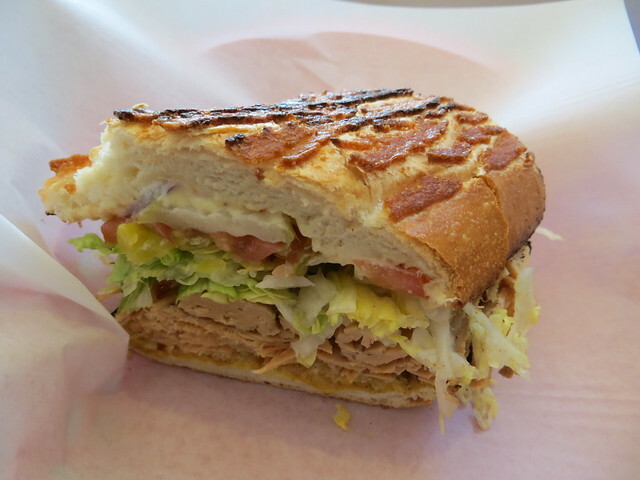 I’ve already mentioned the stellar roast turkey from Bite Me sandwiches and their best-in-class Dutch Crunch. How about we add to that some creamy brie and a handful of salt and vinegar chips? That’s what you get in the Love Affair ($6.75) and it’s a genius move, adding salt, vinegar, and texture to each bite. But I don’t think it was the same Dutch Crunch bread I remembered from childhood? Oh well, Poul’s exists again, so it’s fine. 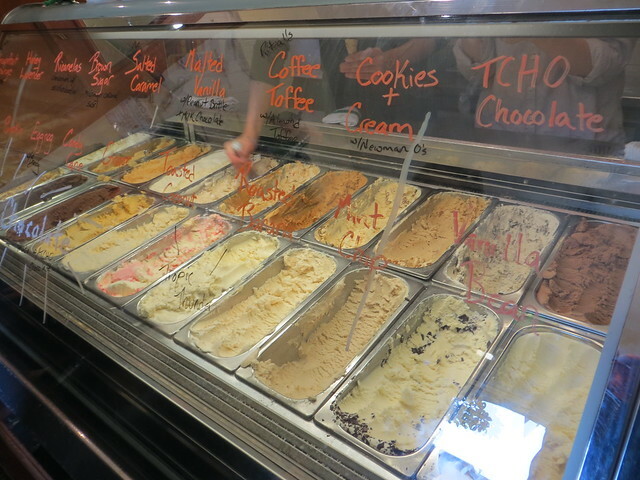 Honestly, the ice cream was dinging all sorts of lactose-issue alarms in my stomach, but I was in it to win it. Next we swung by the Painted Ladies (AKA the house from Full House), on our way to Sutro Baths, and ended up getting ejected from a broken-down bus into fog bank that came out of nowhere, near Golden Gate Park. We decided to keep going on foot, picking up a French/Bostonian tourist who had been heading to the beach to see the sun set. Instead we watched the fog… linger. Then we shared an Uber to Union Square, where we parted with the French guy, who treated us like benevolent kidnappers. Long story short, we went to Chinatown for dinner. After attempting to get into several restaurants, we ended up at Chung King. 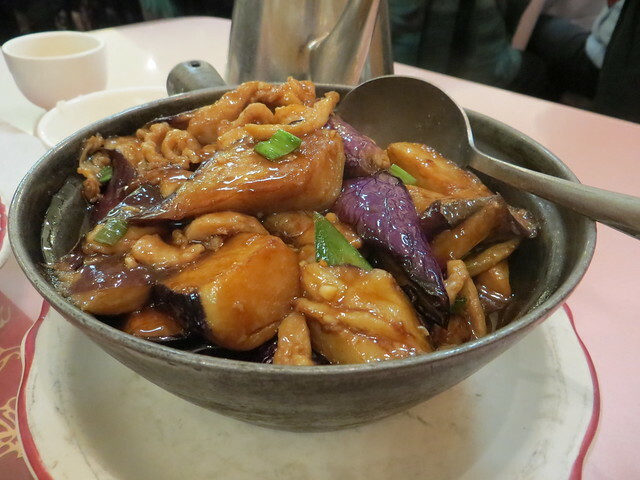 Chicken and eggplant hot pot. I neglected to take a picture of the lo mein because we always get lo mein, but the noodles were a hair wider and flatter than our local place, which was intriguing. Then we made our way back to our hotel, stopping by Boudin’s on the way. We possibly snuck into their little museum? Nobody was there to stop us. Got one sourdough round, should have gotten one of everything! We thought about doubling back to the Ferry Building for picnic ingredients, but it was our last day and time was of the essence, so we figured we’d just sort of stumble upon picnic fixings as we walked toward the Golden Gate Bridge. 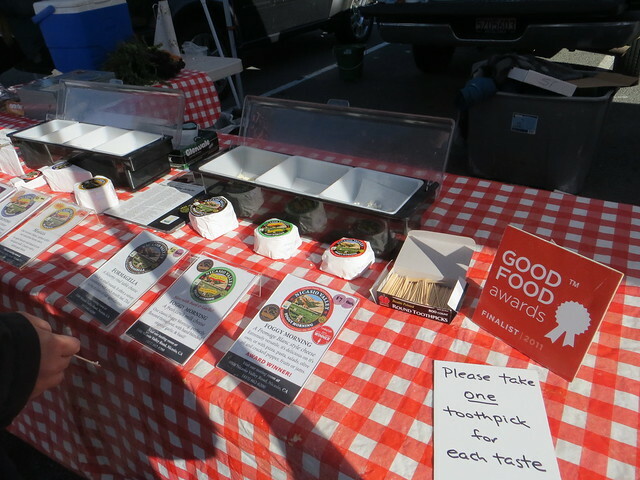 Because SF is awesome, we came across the Fort Mason Farmer’s Market, where we acquired sweet satsumas (little oranges) and delicious, award-winning Foggy Mountain cheese. Perfect for a simple picnic. 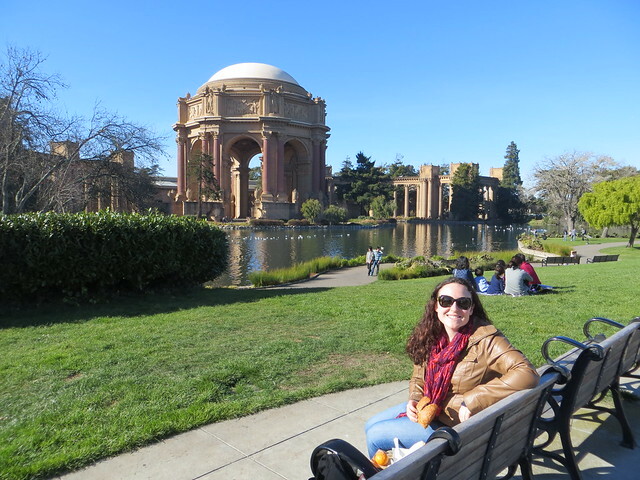 So picnic we did, at the Palace of Fine Arts. From there, we walked to (and about halfway across) the Golden Gate Bridge. Luckily the fog stayed at bay. The funny thing is that the bridge is technically part of the 101 freeway. 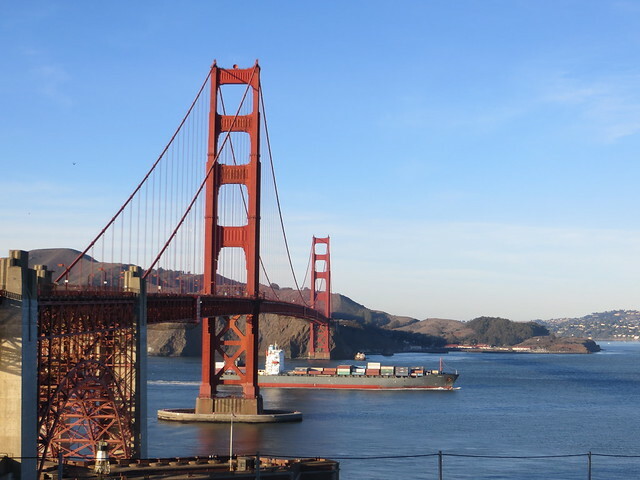 Like, just another day on the 101 north, except today it’s not taking me to work… it’s the freakin’ Golden Gate Bridge. We took the bus back to the city, where in an attempt to find Lombard Street we ended up climbing some steep-ish streets. (I don’t like steep-ness very much, but we were on a mission.) 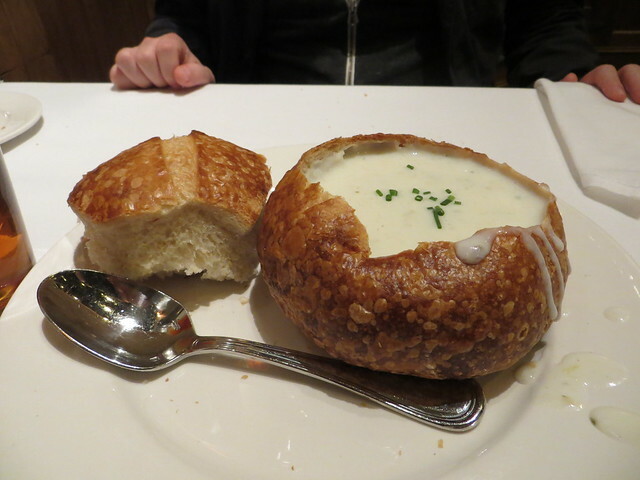 Then we had our last dinner in SF (before heading to the airport) at Bistro Boudin, because bread. With little croutons, of course. 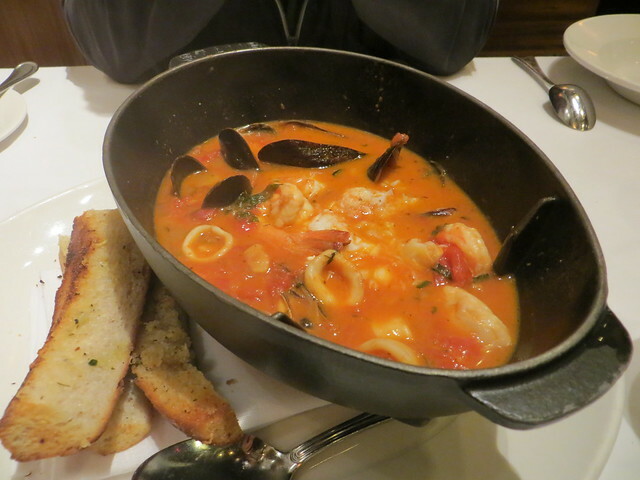 And, last but not least, SF’s very own — cioppino. Sweet meats of the sea. I have no record of dessert, so I guess we were finally too full? I’m starting to figure out why my cholesterol got so high… but it was worth it! I’m always really satisfied when I can pull off seeing/trying as many things as possible. 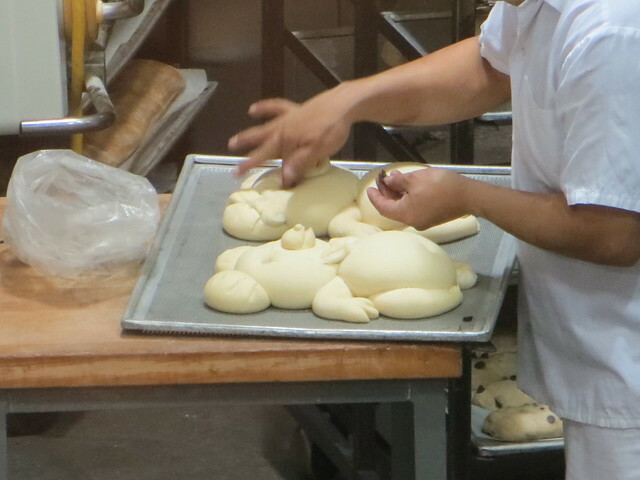 It was a very delicious trip… and I have a whole list of things to do next time. SF is a city dense with activities! Any recommendations for next time? 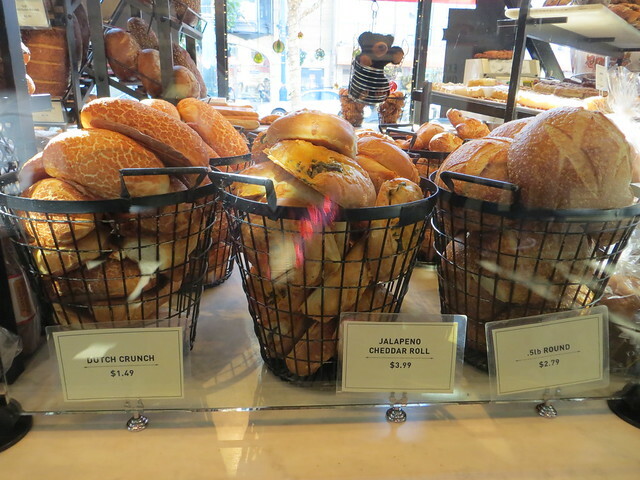 What’s your favorite snack trek in SF?